There is a lot of DVD media player available on Windows platform now, not including Windows Blu-ray Media Player. To enjoy DVD media on WMP, you need third party DVD codec. There is a little complicated for users to download DVD codec and make WMP compatible with DVD media files. So here we recommend you an all in one free DVD Media Player - Aurora Blu-ray Media Player - which can playback all types of DVD media like disc, ISO, folder directly on your Windows platform. Aurora Blu-ray Player built-in with the advanced DVD decoder can be used as standalone free DVD media player for Window 7, Windows Vista, Windows XP and Windows 8. The tool is also a multi region DVD player software which allows you to enjoy all region DVD (you can define the region code up to 4 times). Besides the DVD media playback function, you can also enjoy Blu-ray media, HD media, HD audio with this Aurora free DVD media player software. How to Use Free DVD Media Player for Windows 7? Step 2. The is no complicated operations for enjoy DVD media on your computer, what you should do is just to drag and drop the DVD drive, DVD ISO or DVD folder into the application icon for loading and playback. Note: You can also load DVD movies in your own way: click “Open File” to load DVD ISO movies; click “Open Disc” to load DVD disc and DVD folder files. Step 3. 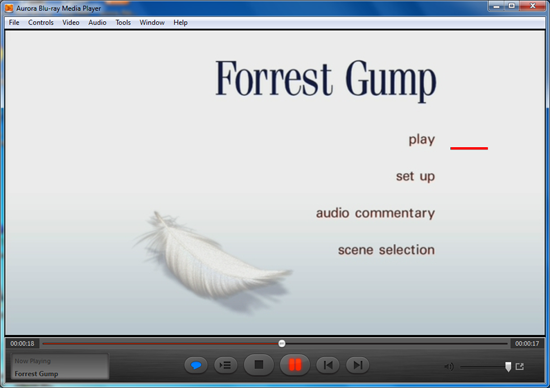 The style DVD menu allows you to adjust Preference before playback. You can choose the chapter want to enjoy and go directly. Step 4. The player supports the Dolby 5.1 audio output. 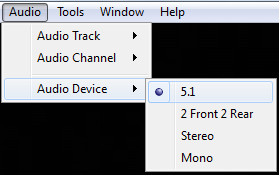 If you have a 5.1 channel output device, just adjust the audio output option under Audio menu. Note: You can use “Ctrl+Alt+S” combination key to tack snapshot of your favorite scene. How to play Blu-ray Disc with Windows Blu-ray player? How to play Blu-ray ISO on the best Blu-ray player for PC? How to Play 1080P MKV on Mac with Free Mac MKV Player?